Bake the cake as directed in a 9x13" pan. Let cake cool completely. Poke holes in cooled cake. Mix 1 package orange gelatin dessert with 1 c. boiling water and 1 c. cold water. Pour over cake. Cover and refrigerate for 4 hours. Mix pudding mix with cold milk the other package of orange gelatin dessert and vanilla. Beat by hand with a whisk until thickened. Fold in the whipped topping. Frost the cake with the pudding mixture. This delicious cake really does taste like a creamsicle! This is a great crowd pleaser I always get lots of compliments when I bring this to a pot luck or family gathering. Its one of those recipes everyone wants a copy of. 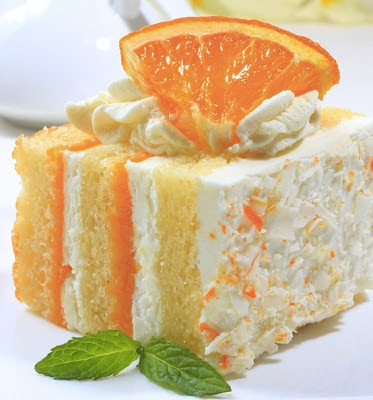 The gelatin dessert poured over the cake gives it ribbons of orange that look and taste great and the frosting.....you could eat it right out of the bowl!